The Basilica stands on the site of another built by the Emperor Constantine at around 314 A.D. in the grounds of the noble Laterani family, from whom the entire area gets its name. Repeatedly damaged (often as a result of fires) and restored, the basilica was embellished with a series of artistic treasures and adornments accumulated over the centuries. In the Christmas period in the city ' of Rome breathes a unique atmosphere : the streets are lit up with thousands of lights , the streets are filled with stalls selling sweets and glittering decorations and numerous skating rinks are set up for the enjoyment of young and old . In Rome in this period Not That There's the ' spoiled for choice : Grinzing Village 05/12/14 - 19/01/15 A track of 800 meters squares , in the picturesque setting of Castel Sant'Angelo , to be able to twirl Throughout the period of the Christmas holidays and beyond, Together with the children . The structure , perfectly integrated in the frame and nda Traditional Symbols of the Christmas holidays , and open daily with hours no- stop From 10 to 24 and offers the possibility of athletes and curious to try their hand at one sport practicable without SPECIAL Problems safely and - with few technical lesson - Even Correct . The track, which has a capacity of about 150 PEOPLE , provides instructors to accompany Degree Qualified in both adults and children nia Their First Steps on the ice . From 12/09/14 to 06/01/15 It Turns Ice Station Stazione Tiburtina An ice skating rink , with entertainment and diverse entertainment . Ice Park - Tor di Quinto 25/10/14 - 05/01/15 Open daily with the Following hours: Monday to Friday : From 10 to 13 , from 17 to 18 and from 21 to 24 ; Saturday from 14.00 to 24.00 ; Sunday from 10 to 13 and from 14.30 to 24.00 . In December , every Saturday and Sunday from 16:00 to 19:00 , the hoot of Santa Claus . Enter please your design . will participate in the competition " The award of Santa Claus ." Ice Park - Euroma2 29/11/14 - 01/03/15 Location really impressive for the new village Ice Park in Rome. Here , one from Leaving ' December 8 and up to March 1 , Sara can skate on our track and approach this sport so much fun and loved Especially More Dai Young . 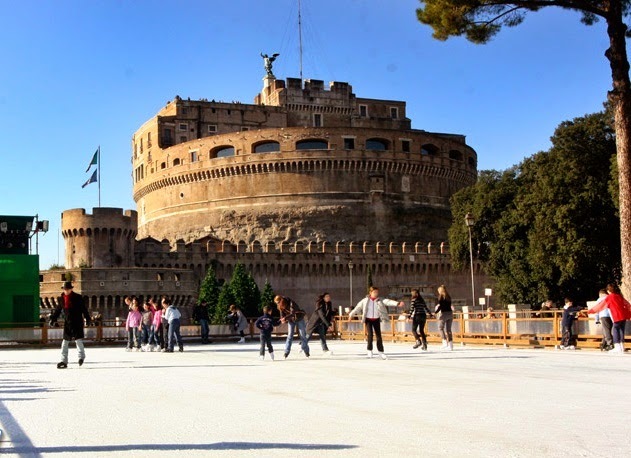 Ice rink - Porta di Roma 11/22/14 - 02/28/15 EVERY weekend One ice show : November 30 and December 14 : Musicals on Ice ; 6 and 7 December : Piazza Grande ; 21 and 22 December . Cristmas Carol . For the little ones , AFTER EVERY show, possibility of price the photo with the goblin " Harold " . The view onto the dome of St. Peter’s from Via Niccolò Piccolomini is an experience not to be missed. From here, in fact, the dome may be seen … from quite a unique perspective. Walk along the road, keeping you eye on the dome, and the nearer you get, the further away the dome seems to go. If you move back, the dome on the other hand appears to get larger and nearer. It is a magical illusion, a fascinating perspective fooling the eye. 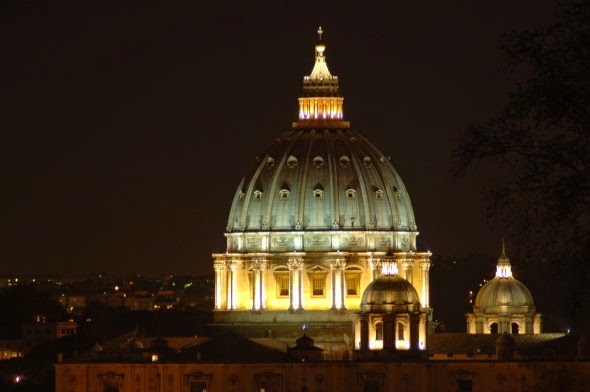 It is all the more effective as the object in question is St. Peter’s dome; a strange optical illusion, which is attributable to the layout of the buildings. A magical illusion making Via Niccolò Piccolomini quite exceptional as well as an ideal spot to end your day out in the city centre or, why not, to make a romantic evening even more special. Michelangelo’s Last Judgment and other works in the Sistine Chapel by key Italian artists, including Botticelli, Perugino, Pinturicchio and Ghirlandaio, can now be seen in a new, splendid light. 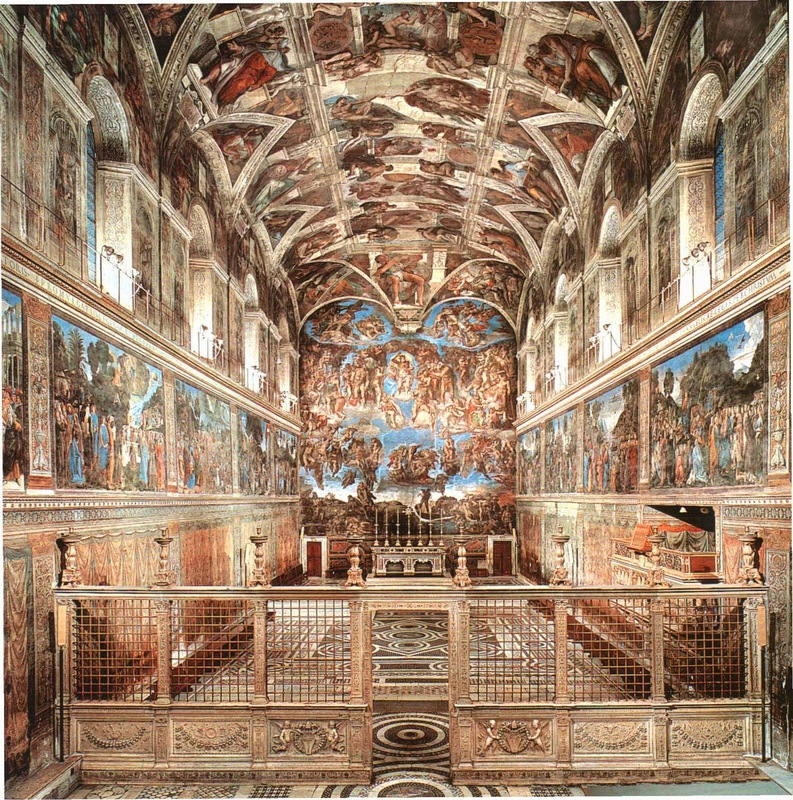 The Sistine Chapel frescoes are now lit up for the benefit of visitors by 7,000 LED lights. This “low cost” solution provides for optimal impact of the colours. The walls and vault of the chapel are lit evenly, and power consumption is reduced by approximately 60%. A new conditioning plant has been installed inside the chapel, capable of monitoring and controlling temperatures and humidity levels under all outside weather conditions and according to the numbers of visitors under the vault. The year 2014 marks the two-thousand year anniversary of the death of Augustus, and Rome has chosen to celebrate this through a program of special events and guided tours. The ancient villas Casa di Augusto and Casa di Livia are open for the occasion. These are the most intimate sites depicting the life of the first emperor and his family, as well as the perfect balance of tradition and innovation that characterized Augustus’ reign (open to the public starting 18 September 2014). 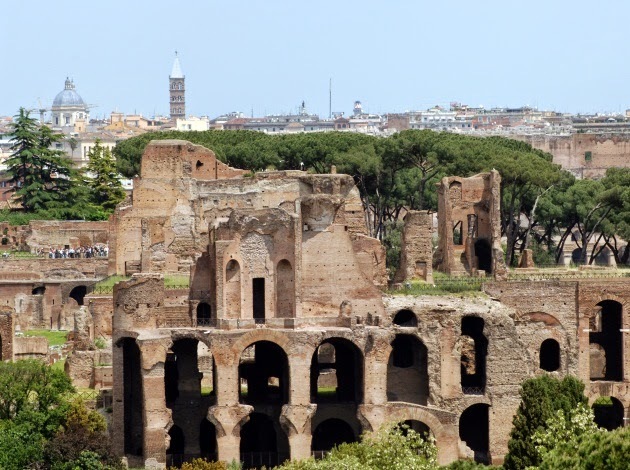 In the Roman forum, there is another grand re-opening to the public, this time of the ancient road Vico Iugario, through the Basilica Julia, another important Augustan monument (open to the public starting 1 October 2014). For this same occasion, the magnificent complex of the Diocletian Baths will show off the results of preservation efforts carried out on the front of the monumental swimming pool and other structures remaining from the ancient baths. The nearby Aula VIII is decorated with grandiose architectural fragments from the baths finally put on display for the public. The restoration of this immense complex also involved the Renaissance structure of the Monastery of Santa Maria degli Angeli, which was built on top of the ancient ruins. The tour through the small cloister of the monastery features the meticulously restored inscriptions of the Arval Brethren and Ludi Saeculares – an ancient brotherhood and practices which were revived as part of the religious policy of Augustus (open starting 24 September 2014). In the neighborhood of Prima Porta, the city has also re-opened the Antiquarium of the Villa of Livia, also known by the Latin name of ad Gallinas Albas; this was the home of the wife of Augustus. The project includes the restoration of the lauretum, the famous laurel grove (open starting 12 September 2014). All four locations of the National Roman Museum will join in the celebration: the Crypta Balbi, monumental complex from the Augustan period, with a restored a head of Livia; Palazzo Altemps, the Diocletian Baths; and finally Palazzo Massimo. Here, in memory of the calendar made by Julius Caesar – predecessor and adoptive father of Augustus – there will be an exhibit entitled “splendors and calendars in ancient times” (14 November 2014 – 2 June 2015). A pochi minuti a piedi dal Bed and breakfast Maior troviamo San Pietro in Vincoli. Via Cavour: partendo dai Fori, verso la metà, sulla destra, si incontra la ripida scalinata di via San Francesco di Paola. Una scalinata stretta e umida. Ma giunti alla sommità ci aspetta una sorpresa: la tranquilla piazza di San Pietro in Vincoli, dominata dalla facciata cinquecentesca della omonima chiesa. La chiesa venne fondata nel V secolo dalla imperatrice Eudossia, per dare degna custodia a una preziosa reliquia: la catena che avrebbe stretto il corpo di San Pietro, prigioniero a Gerusalemme. L’edificio fu ricostruito nell’ VIII secolo; ulteriori interventi avvennero nel 500 (la facciata e il portico) e nel 700 (l’interno). La reliquia non cambiò mai luogo; ancora oggi viene conservata sotto l’altar maggiore, e viene esposta ai fedeli il primo agosto di ogni anno. Tuttavia, non è la catena di San Pietro ad avere reso celebre questa chiesa. Dal 1545, nel transetto di destra, si può ammirare uno dei capolavori dell’arte cinquecentesca, il Mosè di Michelangelo. La statua fu scolpita nel 1513, per ornare il monumento funebre che Giulio II aveva commissionato al Buonarroti. 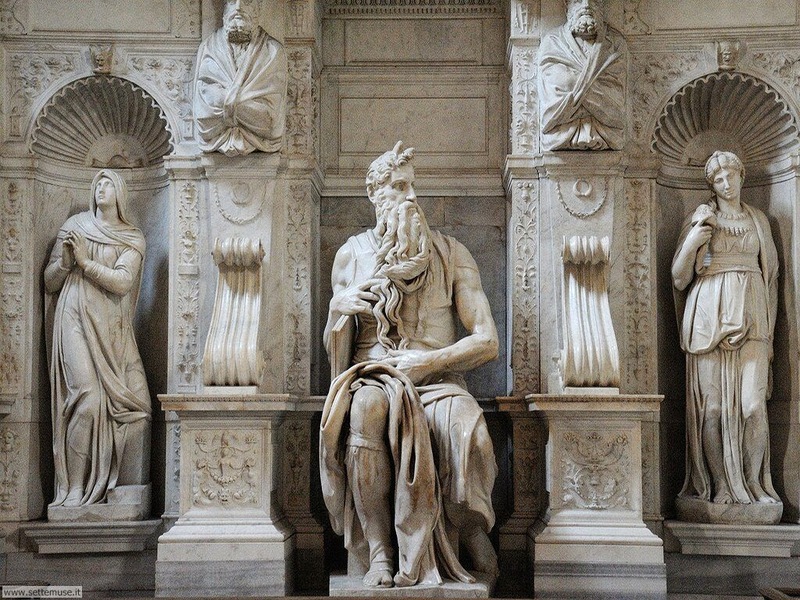 L’artista aveva progettato un complesso architettonico e scultoreo grandioso, ma aveva dovuto sospenderne l’esecuzione, in quanto l’interesse del papa era indirizzato tutto alla ricostruzione della basilica di San Pietro. L’idea del mausoleo sembrava accantonata. Per Michelangelo fu una delusione, un dolore che lo portò a definire la vicenda “la tragedia della sepoltura”. Near bed and breakfast Maior. Only 3 stops by Maior, in Piazza del Popolo (historic center), there will be a bautifull show! 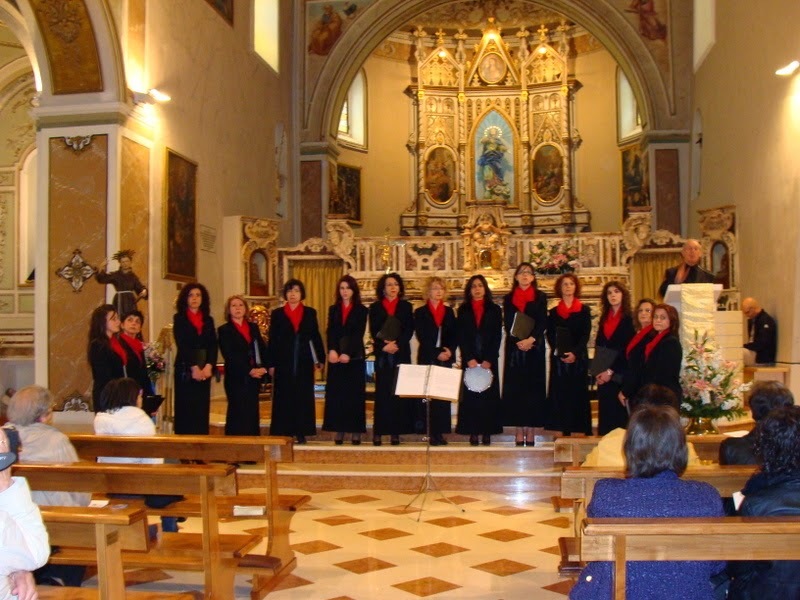 Il ventre di Maria, music by Nicola Samale, text by Imma Battista, for female chorus and orchestra, with narration by actors Vittoria Faro and Giuliana Vigogna.